Let’s Move! Michelle Obama’s program to improve kids health and nutrition. Let’s Move! 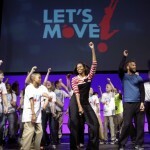 is an initiative that was launched by the First Lady, Michelle Obama. This wonderful program and blog is focused on getting kids moving and eating right, and includes the first ever task force on obesity. I am very honored to be featured as Lets Move! is one of my favorite resources, both for schools and parents. I’ve seen criticism by some that the Let’s Move! campaign is too much government overstep into the personal lives and choices of parents, but this is absolutely not the case. Would anyone accuse the work done by the American Heart Association of overstepping? Unfortunately, politics often gets in the way of an otherwise great message: eat better, exercise more. 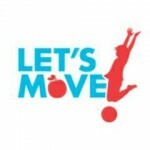 Thanks to the Let’s Move! initiative, Disney and the Department of Defense announced they would make changes to their nutritional standards, and through the partnership with the HealthierUS School Challenge, more than 5,000 schools now have improved fitness and nutritional standards. So, Let’s Put Politics Aside! and just appreciate the services, education, resources and improvements that are available thanks to this excellent program. Let’s Get Real! and realize that childhood obesity is serious problem. And while we are at it, Let’s Stop Whining! If you don’t want to follow the guidelines or access the information or participate in the program, then don’t. Although, I suspect if you are someone against improved health guidelines then you are here by mistake anyway. For the rest of you, check out the resources available from Let’s Move! Start with the Simple Steps for Success if you are looking to make improvements at your school.